Doing nothing while going through the motions of doing something perfectly defines the Securities and Exchange Commission. Today the Securities and Exchange Commission is continuing its illusion of dealing with the rigged structure of the U.S. stock market by holding a meeting of its Equity Market Structure Advisory Committee, some of whose members have themselves been charged with rigging the market. 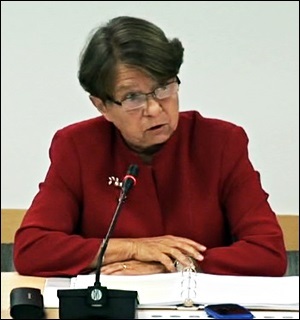 The deeply conflicted SEC Chair, Mary Jo White, will deliver opening remarks. “For me the term high frequency trading seems wrong. You know this isn’t trading. Traders have good days and bad days. Some days they make good trades and they make lots of money and some days they have bad trades and they lose a lot of money. But high frequency traders have only good days. Lewis has become to Wall Street what Bernie Sanders is to the political establishment: a truth teller who just keeps hammering away at a systemically corrupt system. Lewis sports a degree in economics from the London School of Economics and writes with the authority of an insider. Lewis got his start on the trading floor of Salomon Brothers as a bond salesman where he was seated next to the raucous traders. Lewis wrote about that experience in a bestselling classic “Liar’s Poker,” and has been documenting Wall Street crimes ever since in books and articles, including the recent “The Big Short,” which was made into a movie. The popular film captures the insidious greed and corruption that led to the 2008 collapse of century old Wall Street firms and meltdown of the U.S. economy. One such lawsuit was brought by law firm Robbins Geller which provided the court with the specific details of the manipulative techniques being deployed daily in what had once been the most respected stock market in the world. This case was dismissed by the Federal District Court, as were other lawsuits of a similar nature. It wasn’t that the Courts didn’t believe the charges. The Judges simply twisted their legal logic into a pretzel to get rid of complex cases in which the Wall Street defendants had lined up almost every bulge bracket law firm in New York to bury the Court under mountains of paper and appeals.